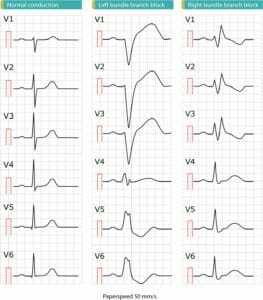 In this article you will learn about rhythms arising in, or near, the atrioventricular (AV) node. The most common rhythm arising in the AV node is junctional rhythm, which may also be referred to as junctional escape rhythm. Junctional tachycardia is less common. Basic knowledge of arrhythmias and cardiac automaticity will facilitate understanding of this article. There are cells with pure automaticity around the atrioventricular node. These cells are capable of spontaneous depolarization (i.e they display automaticity) and can therefore act as latent pacemakers (which become active when atrial impulses do not reach the atrioventricular node). The cells in the atrioventricular node itself may start discharging impulses under pathological circumstances, such as in ischemia. In both cases listed above the impulse will originate in the junction between the atria and the ventricles, which is why ectopic beats and ectopic rhythms originating there are referred to as junctional beats and junctional rhythms. The atria will be activated in the opposite direction, which is why the P-wave will be retrograde. 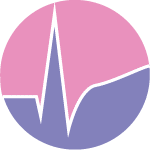 In most cases the P-wave is not visible because when impulses are discharged from the junctional area, atria and ventricles are depolarized simultaneously and ventricular depolarization (QRS) dominates the ECG. If the atria are activated prior to the ventricles, a retrograde P-wave will be visible in leads II, III and aVF prior to the QRS complex. If the ventricles are activated prior to the atria, a retrograde P-wave (leads II, III and aVF) will be seen after the QRS complex. 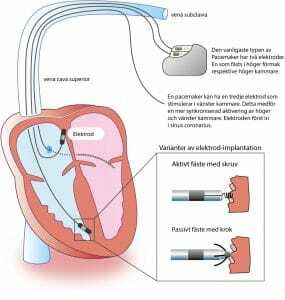 If the normal sinus impulse disappears (e.g sinus arrest) cells around the atrioventricular node may discharge impulses. Less than three consecutive beats are referred to as junctional beats (also called junctional escape beats). Three or more consecutive junctional beats are referred to as junctional rhythm (also called junctional escape rhythm). Junctional escape rhythm is a regular rhythm with a frequency around 40–60 beats per minute. In case of sinus arrest (or any scenario in which atrial impulses do not reach the atrioventricular node) junctional escape rhythm may be life-saving. During complete heart block (third-degree AV-block) the block may be located anywhere between the atrioventricular node and the bifurcation of the bundle of His. If there are cells (with automaticity) distal to the block, an escape rhythm may arise in those cells. For example, consider a complete block located in the atrioventricular node. In such scenarios, cells in the bundle of His (which possess automaticity) will not be reached by the atrial impulse and hence start discharging action potentials and an escape rhythm. This will also manifest as a junctional escape rhythm on th ECG. Indeed, the surface ECG frequency cannot differentiate escape rhythms originating near the atrioventricular node from those originating in the bundle of His. Well-trained athletes may have very high Vagal tone which lowers the automaticity in the sinoatrial node to the point where cells in the AV-junction establishes an escape rhythm. This is asymptomatic and benign. Regular ventricular rhythm with rate 40–60 beats per minute. Retrograde P-wave before or after the QRS, or no visible P-wave. The QRS complex is generally normal, unless there is concomitant intraventricular conduction disturbance. Figure 1 (below) displays two ECGs with junctional escape rhythm. Figure 1. Two types of junctional (escape) rhythm. Symptomatic junctional rhythm is treated with atropine. Doses and alternatives are similar to management of bradycardia in general. Junctional tachycardia is caused by abnormal automaticity in the atrioventricular node, cells near the atrioventricular node or cells in the bundle of His. It is very rare among adults and elderly, but is relatively common in children. When occurring in adults and elderly it is referred to as nonparoxysmal junctional tachycardia (NPJT) whereas it is referred to as junctional ectopic tachycardia (JET) in children. NPJT is caused by ischemia, digoxin overdose, theophylline, overdose cathecholamines, electrolyte disorders and perimyocarditis. As true for the other junctional beats and rhythms, the P-wave is retrograde (or invisible). However, if the junctional impulse is not conducted retrogradely the atria may run an independent rhythm; this is called atrioventricular dissociation (AV dissociation) because the atrial and ventricular rhythms are dissociated from each other. This type of AV dissociation is easy to differentiate from AV dissociation due to third-degree AV-block, because in third-degree AV-block the atrial rhythm is higher than the ventricular; the opposite is true in this scenario. It may be very difficult to differentiate junctional tachycardia from AVNRT. The primary objective is to treat the underlying cause and/or eliminate provocative medications. Electrical cardioversion is eneffective and should be avoided (electrical cardioversion may be pro-arrhythmogenic in patients on digoxin). 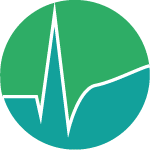 If the genesis of the arrhythmia is unknown or if the arrhythmia persists after removing medications, it is recommended that amiodarone, beta blockers or calcium channel blockers are tried, in that order.